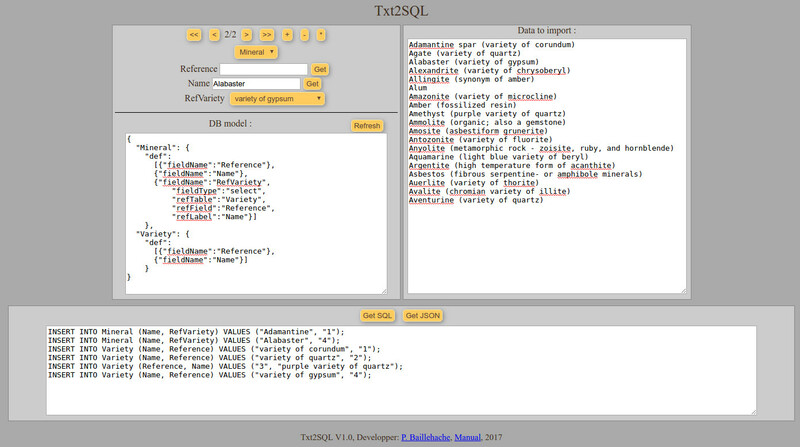 Txt2SQL is a small web application to help the user willing to import unformatted text data toward a SQL database. This operation consists basically in copying from a source text and pasting into a database through its interface, or into an editor of commands later sent to the database. Either the interface or the command editor usually implies a linear process (one command executed at a time, one record saved at a time, ...) which is unsuitable for processing unsorted/splitted data. Txt2SQL allows the user to input data in any order, to modify the database model on the fly, and simplify the copy/paste operation. It generates a list of SQL commands (INSERT) to be executed with other tools. It is a small, self sufficient tool which runs locally or on the Web. The user can save its work and continue it later, and has access to the model, the data and the resulting command, allowing him to modify them according to various kind of format in input. The content of this webpage and the pdf manual are Copyright 2017 Pascal Baillehache (Pascal at BayashiInJapan dot net).